Scoot has done it once again with frenemy SGAG. 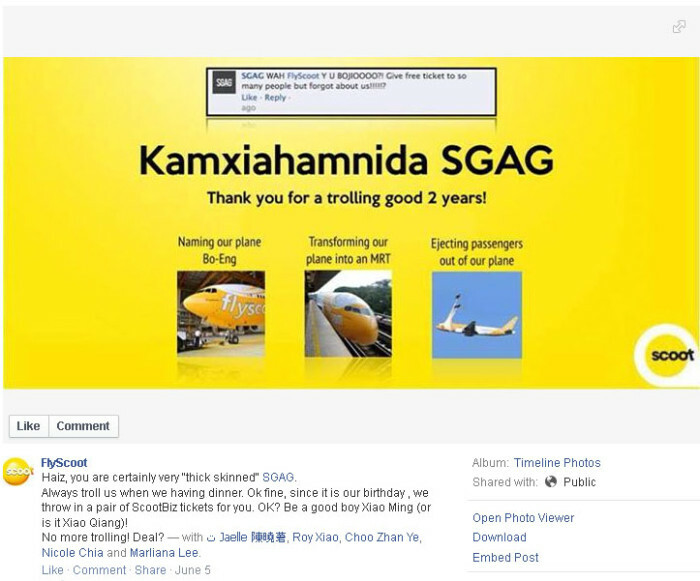 In the midst of Scoot’s second anniversary promotions which saw the airline launching a campaign giving out free tickets and SG$50 vouchers to all destinations, SGAG decided to troll the budget carrier. In a quick conversation with Marketing, Sharon Koh, head of marketing at Scoot explains what actually happened. 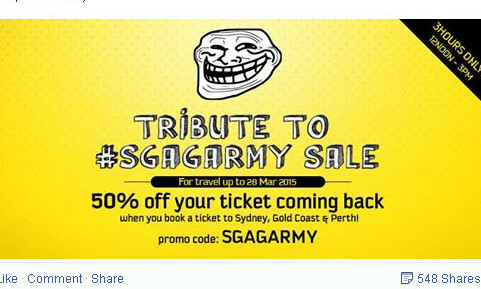 “SGAG seems to have a penchant when it comes to trolling us at every opportunity. The last time SGAG trolled us was during an award/dinner ceremony we had with Marketing Magazine and this time it also did so during dinner time, which was why we decided to take a tongue-in-cheek approach to them this time,” said Koh. 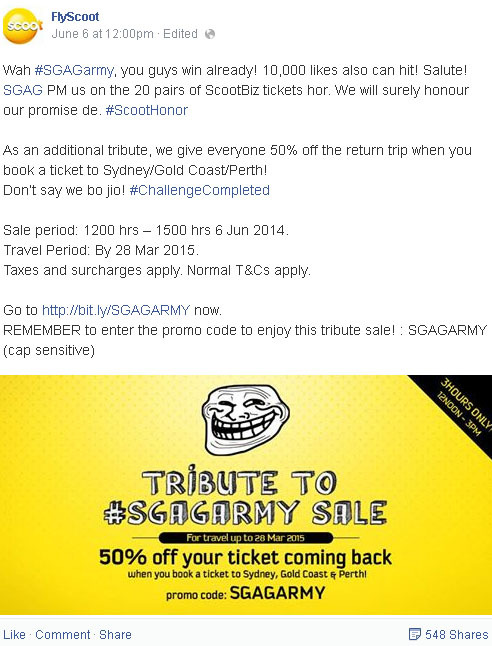 That pulled in quick responses from Scoot and SGAG fans. “It became a “live drama” of sorts on our Facebook page and we decided to continue the drama by issuing a challenge where if our comment got a thousand likes we would give away 10 pairs of tickets,” explained Koh. Within an hour, the likes were achieved and Scoot then decided to push the challenge to getting 10,000 likes before giving away 20 pairs of ScootBiz tickets. The 10,000 was achieved over night, and by 11 am the next day there were over 15,000 likes for the post. The banter between the two also resulted in Scoot’s Facebook seeing an increase of 2000 likes overnight. To further draw out the community’s enthusiasm, the next day Scoot decided to have a flash sale for three hours where it handed out 50% off deals to Australian destination. “We saw the SGAG Army and the Facebook community helping each other out to get the likes and there was a very strong community spirit going on on our Facebook Page, which was really great fun and everyone felt like real friends,” said Koh. On Scoot’s end, she added, the brand definitely gained a lot of brand awareness and a strong climax to our second anniversary campaign . The trolling and interaction drove new people to its website to enjoy the last few hours of its second anniversary promotion. In an earlier article on Scoot’s witty SGAG maneuvers, industry experts lauded the brand for being good at its feet. Simon Kemp, regional managing partner at We Are Social said that the reactions by the airline help increases audience engagement and the response by Scoot allows the brand to retain its humorous and fun brand image and genuine nature. Keith Timimi, chairman of VML also said the move is a refreshing one. Ultimately such camaraderie of spirit is needed in winning fans at the end of the day. Alcohol brand Diageo has set ambitious sustainability targets for 2020, looking to build leadership in its category. ..
Set to reach 200,000 Singaporean men, men’s wear brand Celio has partnered with digital creative agency noisycrayons to launch the..